KVLY anchor Chris Berg and white nationalist Pete Tefft, right. The station, known as Valley News Live, defended its policy by comparing white nationalists to transgender people. “In our eyes, it’s no different than referring to someone who is transgender by the gender identity of their choice,” the TV station’s message said. 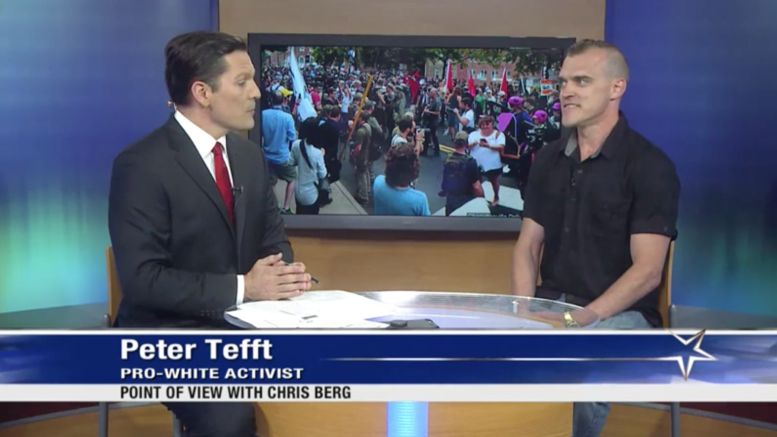 KVLY was responding to criticism it received for an interview it did with Pete Tefft, a local insane person/racist man who attended the white nationalist rally in Charlottesville over the weekend. During the interview, host Chris Berg (who at one point kept a Trump bobblehead on his office desk) apologized after calling Tefft a white supremacist. Berg’s apology came after Tefft described Jewish and black people as being somehow unable to share in a national identity with white people. Tefft also refused to acknowledge that black people in America are Americans. “I can’t speak for them, bro!” he said. A graphic during the segment described Tefft as a pro-white (no quotations) activist, and Berg called Tefft pro-white (no quotations) in a Twitter post plugging the segment. First of all, thanks for watching! We always appreciate viewer feedback. Secondly, Chris Berg is not a journalist and POV is not a news program. It’s literally titled “Point of View.” It is an opinion show and Chris Berg is the moderator. Thirdly, Mr. Tefft refers to himself as a pro-white activist. In our eyes, that’s no different than referring to someone who is transgender by the gender identity of their choice. Finally, please by all means send it to our parent company. Our corporate executives are very pleased with the work we do at Valley News Live. As always, thanks for watching and have a great day! When someone attends a huge white nationalist rally, and talks about black and Jewish people that way, it’s perfectly fair to say he’s a white nationalist. Also, this has nothing to do with gender identity, and it’s really puzzling as to why the station would combine two unrelated issues. Tefft is a public figure; he’s been outspoken about his views, and the media should be accurate in reporting what his views are. If he happened to identify as a woman, then it would be perfectly fine to call him a “white nationalist woman.” The gender is irrelevant; it’s his ideas that matter. Be the first to comment on "Valley News Live: “Pro-White” Label “No Different” From Gender Identity"